The flagship Casio Privia PX-870BK offers outstanding performance combined with sleek, compact contemporary design. The piano is operated by a discreet control panel positioned in the left corner of the piano. 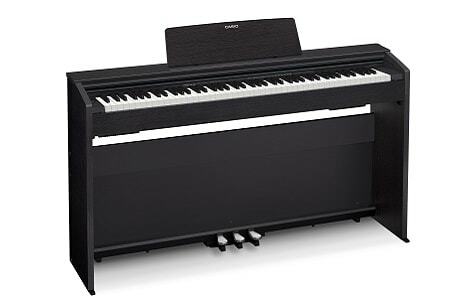 The PX-870BK incorporates ‘Concert Play’ functionality, with an in-built library of ten classical pieces for the pianist to accompany an orchestra. Compatible also, with Android and iOS devices, Casio’s Chordana Play app connects to the PX-870BK and teaches you to play in a fun, visual way. The piano’s sound source has been subtly redesigned to incorporate an upgraded revolutionary new piano sound; most noticeable of all however, is the dynamic Sound Projection speaker system. The Sound Projection feature recreates a remarkably natural piano sound-field and thus ensures this instrument is suited to the home, hall and classroom. The unique Tri Sensor Scaled Hammer Action Keyboard II delivers timing comparable to an acoustic piano, exceptional key response and feel. This key action facilitates the playing of more challenging pieces at speed without noticeable loss of sound quality. The third (extra sensor) in the touch enables seamless dynamics to enter your playing. The PX-870BK is available in both a stylish black matt finish and a white matt finish.